Lily Hunter Green is a musician, composer and visual artist whose work focuses on environment and marginality. Green’s inventive piece Bee Composed (a part of her project Decomposed, exhibited at the Brighton Dome for the Brighton International Festival, 2012) involved transforming a piano into a working bee-hive in which bees dwelled while an installed audio-visual recording device captured the harmonics of the bees’ interaction with the piano strings. One of the central aims of the Bee Composed was to raise awareness about the human-caused threat to the honeybees and, as a result, to us, if we do not do something to stop their decline. Bee Composed was exhibited on the Henry Moore Lawn at Snape Maltings as part of SNAP at the Aldeburgh Festival. Green was then awarded a Residency with Aldeburgh Music in order to expand the reach of the artwork and raise further awareness about the consequential connection between bee ecology and the human ecosystem. Drawing on Bee Composed Green has been developing Bee Composed Live – a live performance piece that combines music, dance and original audio-visual compositions in a bid to explore the ways in which we can artistically and critically draw attention to our rapidly changing ecology and our role in it. In this project Green aims to generate a hive-mind with collaborating artists and audiences, inspired by the collective model of the bee-hive, in order to generate a collective consciousness about our environment and actions that is increasingly shaped and misinformed by the depoliticised narratives around climate change. The workshop Green and I organised at the Birkbeck Arts Week aimed to contribute to the wider project by opening up a conversation about bee society, its correlations to human culture, and about the ways in which art can generate a collective critical thinking towards a change in our ingrained narratives about the fundamentally political issue of global warming. S.I. Why have you chosen to work with and on honeybees as a musician and visual artist beyond your interest in the question of their endangered species and relation to the wider issue of climate change? L.H.G. I began my work with honeybees in 2014. At the time I was working as a Sound Artist, exploring resonant and sustained sounds within different structures and spaces. As a pianist I was anatomizing the inner workings of my piano. By chance a bee flew inside. The sound produced was resounding and alveolated, unlike anything I’d heard before. I immediately began researching the bees. I was confused that I didn’t know more about the pollination crisis, especially given the severity of the problem. 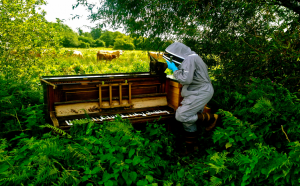 This is when I conceptualised Bee Composed, the idea of converting my piano into a working hive. I became a beekeeper for the project and have been fixated on the subject since. Artistically there is so much to work with, especially since they communicate through music and dance. S.I. What does Bee Composed Live aim to achieve and what does it mean to work as a ‘collective consciousness’ particularly in relation to our networked, globalised world? L.H.G. The primary objective of Bee Composed Live is to present audiences with an alternative way of experiencing and interacting with nature. The intention is to create a simulacrum ‘hive mind’. That is, a unique microcosmic space that enables audience members to experience the inner dynamics and scientific happenings of the hive. The concept of the ‘collective consciousness’ or ‘hive mind’ is an appropriation of how the worker bees administrate the hive, which is a superorganism. Bee Composed Live is a collaboration, it represents togetherness, the power of collective action and the importance of community. S.I. There were questions during the workshop-conversation about whether or how art can re-politicise the problem of climate change. Where do you see your work in relation to such a difficult task? And, how do you aim to generate social engagement through your work? L.H.G. I believe art can definitely contribute to re-politicising the problem of climate change, particularly given the complexity of the subject, and the potential impenetrability of scientific fact and data for most people. I think the role of the artist is to present an alternative way of experiencing the subject, one that provokes new ways of thinking, feeling and responding. Art as a creative transformer, as a catalyst for change, if you like. In terms of Bee Composed Live, it is my aim to engender a greater understanding of the plight of the honeybee and its wider global implications via a series of immersive creative strategies. In terms of the social engagement element within my work, the design of Bee Composed Live is to work around the idea of empathy. By this I mean making the direct connections between human society and the honeybee. That is, creating an installation that encourages and enables the audience to experience, participate and identify with the complexity of the hive itself using multiple inter-connected art forms and activities over an extended period. S.I. How did the collective consciousness model work in the workshop? Do you think you have a hexagon comb to add to the wider bee-hive, if so, could you give us some examples that you could use in the wider performance project? L.H.G. I think the ‘collective consciousness’ as model work in the workshop was extremely productive, particularly in the context of working together to spark debates and collaborative problem-solving. There was a strong element of ‘play’ embedded in the workshop, an invaluable tool for the creative process. Not only did it create the space for new ideas, it re-configured the role of the rebel bee in the context of the workshop ‘disrupters’: an unexpected outcome, and one that highlighted the community problem-solving structure of the hive itself. One suggestion that surfaced from the workshop was the idea of the audience working as ‘one mind’: a ‘super organism’. The basic principle being that audience members, on arrival in the space, would be given a card which will include a series of instructions that they must follow throughout the performance. Not only would this heighten the experience, it would provide a live parallel to the workings of the hive itself. For example, although the queen bee is at the apex of the hive community, she does not control the colony. The queen bee, like the worker bees, drone bees, etc. is programmed to fulfil her role: that is, laying up to 2000 eggs a day and ensuring the future of the colony. The idea here being that as nature controls the hive, pulling the internal collective strings, the audience members themselves have been programmed via the instruction cards to fulfil their own roles in the immersive hive mind performance. I can already see how this could and should be integrated into the final realisation of Bee Composed Live. To date I have been wholly focussed on devising the structural elements of the piece. As a consequence, it was very valuable to consider the role of the audience as active participants rather than passive observers. And, in addition to this, to consider the different roles of the audience members themselves, that is, in terms of their experience, knowledge and diverse interests. S.I. What is the next step in Bee Composed Live and your artwork? L.H.G. I am working with a number of partners to broaden the reach and extend the creative scope of Bee Composed Live. 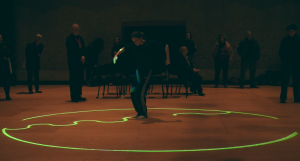 This includes working with EdenLab, scientists based at the University of Cambridge UK-based contemporary dance company Neon Dance, plus other performers, educators and creative practitioners. The intention is to work up the different elements and then bring them together to create the superorganism: Bee Composed Live. The Department of English & Humanities in the School of Arts at Birkbeck is one of the most vibrant English departments in the country. We are based in Virginia Woolf's former house in Gordon Square, Bloomsbury, in central London. Many of our academics are world-class researchers with international reputations. Our department is acknowledged as a centre of academic excellence where there are frequent opportunities to hear and discuss research and ideas with leading thinkers, writers and practitioners. In addition, students will note the the friendly approach of our academic staff, who are not only experts in their subjects, but also have a wealth of experience in teaching and encouraging students. At this blog you can find out more about what we've been reading, watching, and thinking about recently. Nice article. The photo of David with a Les Paul is actually a Standard (with full size humbucker pickups) not a Deluxe as the heading mentions…the Deluxe LPs had the mini humbuckers. It’s really a cool and useful piece of information. I’m happy that you shared this helpful information with us. Please keep us informed like this. Thanks for sharing.